What Are the Benefits of Peptides? Kyle Clayton has been a creative writer since 2007 and now works as a freelance writer for LIVESTRONG.COM. He has worked in the fitness industry since 2007 and enjoys writing about nutrition, exercise and healthy lifestyles. Clayton is the winner of the Rex Reed Screenwriting Award and a UCLA Showcase Finalist. He holds a Master of Fine Arts in screenwriting from UCLA. A peptide is defined as two or more bonded amino acids. 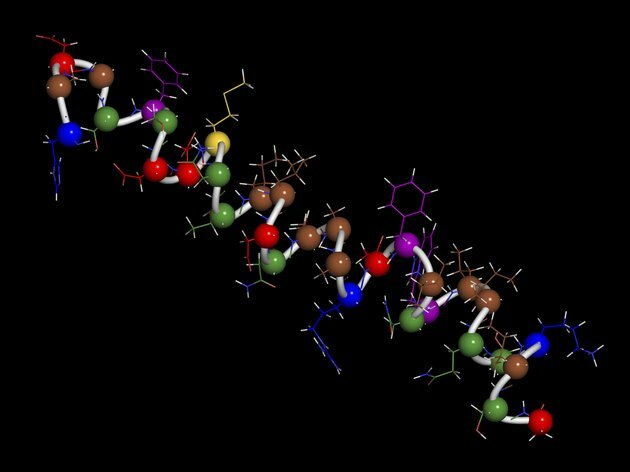 Peptides are precursors to proteins, which require at least 50 bonded amino acids, according to PeptideGuide.com. In addition to performing a host of essential functions in the body, peptides may have formed the basis for cellular life on Earth, according to the article, "Peptides May Hold 'Missing Link'," published on May 3, 2010, based on work by researchers at Emory University. Peptides are essential in researching and developing new pharmaceuticals. These peptides can be natural or synthetically produced to give a patient assistance in areas like immune function and hormone production. According to PeptideGuide.com, the peptides used in drugs are easy and inexpensive to produce, and synthetic peptides can have a positive impact on the function of natural peptides already in the body. Peptides occur naturally in every cell of every living thing. They have a number of functions, including the production of enzymes to help your body break down foreign substances, and create antibiotics for your immune system and hormones that control everything from growth to sexual development. Without peptides, life would not be possible. Synthetic peptides are sometimes produced not as a treatment but as a diagnostic tool. Peptides react to the environment around them. Your doctor can give you diagnostic peptides, which will change to a certain color under a microscope and can reveal certain conditions in your body. For example, a blue to red change can reflect the presence of things like viruses or toxins, according to the article, "Colorimetric Sensors for Drug Discovery and Biomedical Diagnostics," published in Drug Development Research in July of 2000. Diagnostic peptides can also determine how the peptides that occur naturally in your cells are functioning. How Does Your Body Produce Too Much Histamine? What Are the Functions of Peptides?